Google+, just like any other social networking site with messaging and notification options, has its fair share of annoying users. Maybe someone is sending private messages that bother you, or mentioning you explicitly in public posts, or maybe you are are annoyed by page update notifications that you receive, or comments that are left on posts that you make. 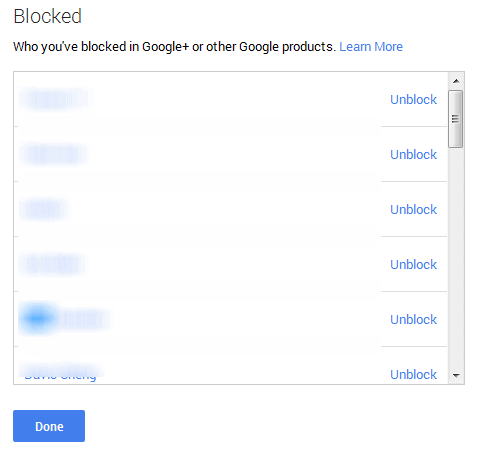 The Google+ network provides you with two options to deal with these situations: block or mute. Muting a profile is not as strict as blocking someone. When you mute a profile or page on Google+ you stop receiving update notifications. What this means is that you won't be notified if you are +mentioned, and that they won't be able to push post notifications either. Note that you can also mute individual posts and entire circles as well. If you mute a post, you won't receive notifications about new comments anymore, while muting a circle prevents that its post are published on your stream's home page. A muted user can still see posts that you make and post comments on them as well. A blocked user's or page's contents are no longer displayed in your stream. They are removed from any circles they are listed in. They are removed from your extended circles as well. Blocked users cannot add new comments, see your comments on your own or other people's posts, see your posts that you share after you have blocked them, and won't be able to mention you in posts or in comments. Once you have made up your mind whether you want to block or mute a user or profile on Google+, it is just a matter of knowing how to do it. 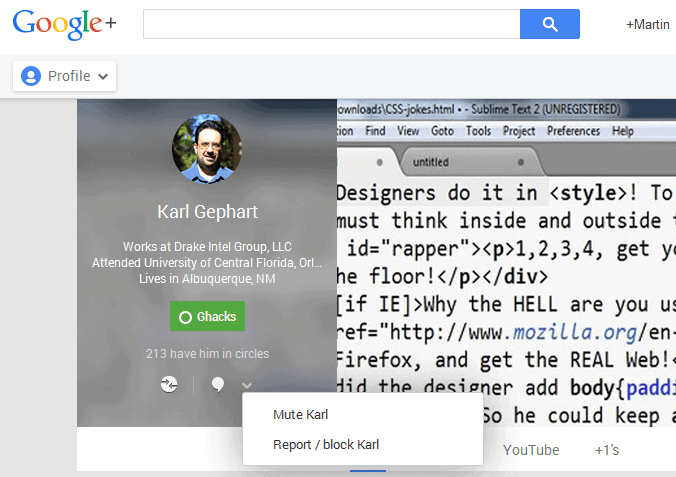 Open the user's profile page on Google+. You find the profile photo and basic information at the top left in the most recent design. There you find a down arrow icon next to the hangout symbol underneath the "have him in circles" or "have her in circles" information. Click on the arrow icon and select the Mute or Report/Block option from the context menu. The options are very similar when it comes to pages. Blocked or muted users are not notified about it. You cannot join a hangout with a user that you have blocked, and blocked users cannot join a hangout that you are already in either. If you post publicly, those posts are still accessible by blocked users when they sign out of their Google account or use private browsing or another way to access the contents. 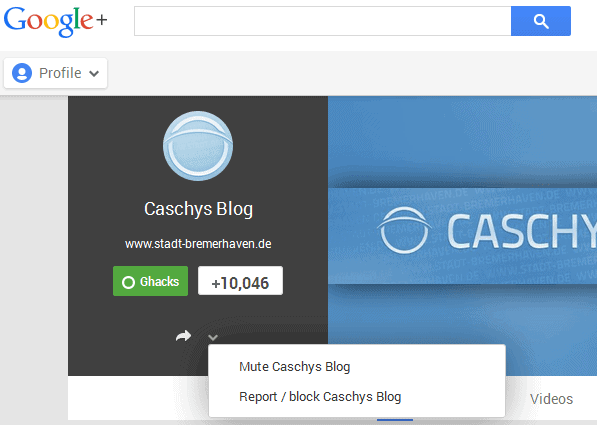 Open the Google Plus website. Locate the Home button, move the mouse over it, and select People from the menu that opens up. Locate the More link at the top, and select Your Circles from the menu. Click on Actions here and select View Blocked or View Ignored. There does not appear to be a way right now to manage a list of muted users. A list with all users and pages that you have blocked or muted appears. The lists are not sorted alphabetically unfortunately, which may make it difficult to find a particular user. The easiest way to locate a user or page is to open the on-page search of your browser -- usually with the shortcut Ctrl-F -- and enter part of the user's or page's name. Here you can also unblock any user that you have previously blocked or muted. Why would anyone want to use google+? Don’t you know that it exists only so google can collect personal information about you. I left facebook for Ravetree because they offer great privacy, not google+. I know a lot of people who are leaving facebook, but they definitely are not joining google+ (unless they are forced to). Do you really think that Google needs any of your help to collect your personnal data ? This question isn’t related to this article but how do you prevent others from tagging you in Youtube comments without blocking them? Thanks! Too bad that technique doesn’t work anymore. if you received a notification email about a comment on a photo a while ago. You then get blocked, you then delete your account but later re activate it. And some time later you reply to the notification email that you received when you weren’t blocked, does the person receive your reply? a bit confusing i know but basically the email went I just don’t know where or if the person received it an hoping not!! 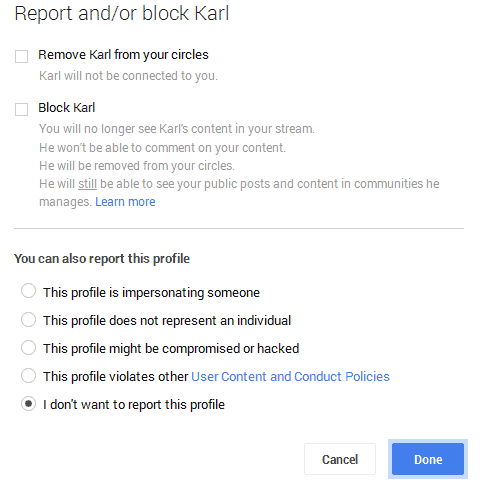 How do you block a harassing YouTube user from responding to or seeing your comments on someone else’s YouTube channel if that person only has a YouTube account but does not have a Google+ account?